Foreign Minister of Iran Mohammad Javad Zarif, Russian Foreign Minister Sergei Lavrov and Foreign Minister of Turkey Mevlut Cavusoglu, left to right, at a joint news conference after a trilateral meeting of the foreign ministers of Russia, Iran and Turkey in Moscow. Experts are working to finalise the text of the new document. After a tripartite meeting in Moscow, Russia, Turkey and Iran are ready to act as guarantors for a new agreement on Syria, Russian Defence Minister Sergey Shoigu said Tuesday. The Minister said experts are already working to finalise the text of the new document entitled the “Moscow declaration of immediate steps to promote the settlement of the Syrian crisis”. “I hope that the declaration proposed today will be supported by you, and we will act as guarantors for the further settlement and implementation of the ceasefire in Syria,” Shoigu appealed to his counterparts from Ankara and Tehran. “All previous attempts to agree on taking joint actions with the USA, or its partners, were doomed to failure. None of them had a real influence on the situation ‘on the ground’,” said the Russian minister. He also noted that Russia and Turkey, working together, were able to separate the terrorists from the opposition in Aleppo, without US participation. “We were able to do the work that our colleagues from the United States had been promising to do for many months–to separate terrorists from the moderate opposition fighters,” said Shoigu. Russia and Turkey were able to do this through “joint efforts”. “We were able to separate the militants, whom we mostly destroyed, from the moderate opposition groups who, for the most part, have been evacuated from Aleppo to Idlib and other provinces,” said Shoigu. Fikri Ishik, Turkey’s Minister of National Defence, called the freeing of Aleppo a “very successful” operation. “Now we see that the operation to liberate Eastern Aleppo from militants is progressing successfully, and the opposition forces are withdrawing from Aleppo with their families, including children,” said Ishik. He expressed hope that the Russian-Turkish talks on Syria, “and Aleppo in particular” would strengthen bilateral relations in other areas. Condoling the murder of the Russian Ambassador to Turkey, Ishik called the incident a terrorist attack and promised that the perpetrators would be found, and details of proceedings shared with Russia. Shoigu expressed condolences for the December terrorist attacks in Turkey. “This is something that, unfortunately, as a result of actions by individual states and individual organizations, has become a tradition in our regions, and we practically do not even notice that each week, several terrorist attacks take place in Iraq, in Libya; every week something explodes, every week peaceful people are killed,” he said. Brigadier General Hossein Dehghan, Iran’s Defence Minister, was more reserved. 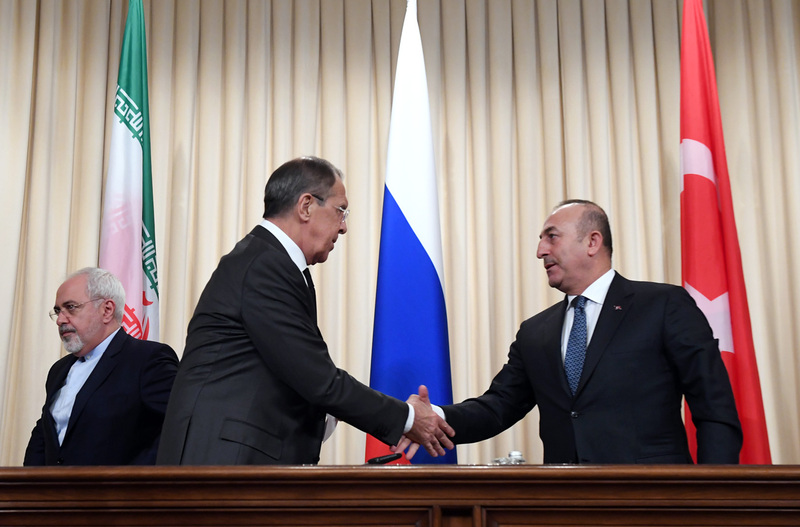 Talks were also held in Moscow between the foreign ministers of Russia, Turkey and Iran; Sergey Lavrov, Mevlüt Çavuşoğlu and Mohammad Javad Zarif. After their meeting, Lavrov said the Geneva International Syrian Support Group (ISSG) has not been able to cope with the problems despite adopting important documents that formed the basis of the UN Security Council Resolution 2254. The group was created with the support of the United States, but an agreement with Washington had not yielded any significant results. The diplomat described negotiations with the USA as “fruitless gatherings”. The foreign ministers of the three countries agreed to provide diplomatic support for the cease-fire in Syria, with the caveat that this would not apply to the terrorist group Islamic State and Jabhat al-Nusra (both banned in Russia). The last phase of the assault against Aleppo played a positive role in the run-up to the talks, said Irina Zvyagelskaya, senior researcher at the Institute of Oriental Studies. “Turkey has made a considerable contribution to the withdrawal of the civilian population of the eastern part of the city. The interests of Moscow and Ankara in Syria, of course, do not coincide. However, there are tactical points of convergence, which will allow the development of positive dialogue in this direction,” she believes. Zvyagelskaya said the positions of Russia, Iran and Turkey have come closer, especially regarding the fate of Syrian President Bashar al-Assad, who is an ally of Moscow and Tehran, but is strongly resented by Ankara. The plan to resolve the situation, laid out in UN Security Council Resolution 2254 and adopted earlier this year was explained to Gazeta.ru by Elena Suponina, Advisor to the Director of the Russian Institute for Strategic Studies and expert at the Russian Council on International Affairs. She said this meant the need to hold new elections in Syria. “In the course of contacts between them, they will determine what kind of elections these will be – presidential or parliamentary, or both simultaneously. They must begin working on a new draft constitution. The new thing here, compared with Resolution 2254, is to create effective mechanisms for the implementation of this plan into reality,” said Suponina. Turkey, Iran, and Russia are in favour of preserving the territorial integrity of Syria. “This is also what the Syrian government wants. And my contacts with representatives of the opposition indicate that they too want to preserve the territorial integrity of Syria,” said Suponina. Whether the victory in Aleppo can be considered a breakthrough remains an open question, because for now, only the pro-Turkish fighters have been taken to Idlib, the real terrorists remain in the city, said Gumer Isaev, Head of the St. Petersburg Centre for Middle East Studies. He felt it was premature to say that if Turkey, Russia and Iran reach and sign an agreement, the crisis in Syria would soon end. “There is a plan on dividing Syria into spheres of influence. The Turks need the north, to prevent the creation of a Kurdish state, and the Russians need to ensure control over the military infrastructure, in particular Tartus. Iran also has interests, wanting Assad to remain in power, or that another Syrian president would remain loyal to Iran, so Teheran would access to Lebanon, to the Shiite Hezbollah,” said Mr. Isaev. Yuri Mavashev, Head of the Political Division at the Centre for the Study of Modern Turkey agrees. The three countries, he said, have agreed on conditional boundaries of influence, which will later become real. Mavashev noted that a settlement is possible only if Russia, Iran and Turkey take into account the interests of other players in the region, such as Saudi Arabia and Qatar. “In such a case, the stabilization of the situation may occur in the more or less foreseeable future. In a couple of years, the conflict may become frozen,” Mavashev explained. However, from time to time, incidents will happen, because no country can take full control of the situation, he said.